Can you make any kind of living as an artist? Published by the NEA, this report differentiates the roles of federal, state, and local agencies, as well as other public entities, along with descriptions of private sources of support. The conclusion describes the complex and evolving web of funding resources. into the economy (total of expenses). ** Total industry spending determined by measuring the spending of 9,721 nonprofit arts and culture organizations and 151,802 of their attendees. Dinner and a show go hand in hand. Attendance at arts events generates income for local businesses — restaurants, parking garages, hotels, retail stores. An average arts attendee spends $24.60 per event in addition to the cost of admission. The purpose of the W.A.G.E. Survey was to gather information about the economic experiences of visual and performing artists exhibiting in nonprofit exhibition spaces and museums in New York City between 2005 and 2010. On average, the majority (58.4%) of respondents did not receive any form of payment, compensation, or reimbursement for their participation, including the coverage of any expenses. “Leaders in the nonprofit arts world, many of them founders and builders of their organizations for decades, will be retiring in unprecedented numbers in the coming years. Organizations could become weaker and destabilized during this transition, a prospect that should be addressed with some urgency. Younger professionals should be able to take on these leadership roles and chart a new course in stressful and changing times. Yet an operational divide between the workplace needs and values of Next Geners and those currently in charge threatens this transition. A Public Thing is a group of artists, writers, thinkers, and doers who are dedicated to preserving and building the public realm — spaces that are open and accessible for people to come together and engage in conversations pertinent to today. About 50 people gathered at Peavy Plaza in downtown Minneapolis to talk frankly about money, debt, big banks vs. credit unions, financial dependence/interdependence, and how all this affects our communities. Financial Engagement: A Public Thing was run by Shanai Matteson and Colin Kloecker from Works Progress; Sarah Peters and Molly Priesmeyer from Good Work Group; Sam Gould from Red76; Molly Balcom Raleigh; and a growing group of artists, designers, and writers. No. 16 Manual for the Immaterial Worker by the Bureau for Open Culture looks at the historical and current conditions under which freelancers and information workers live. Artist Bloc No. 1: Is Art Labor? “L’1% c’est Moi,” was written in August 2011 for the Berlin-based publication Texte zur Kunst. 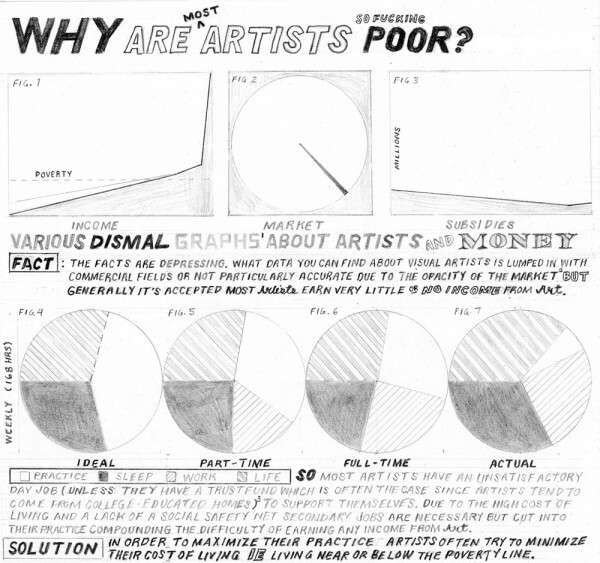 It focuses on the direct relationship between art-market trends and income distribution. “There’s No Place Like Home,” her contribution to the 2012 Whitney Biennial, takes the form of art discourse but also focuses on the role of art discourse in the art world today. The artist elaborates on the contradiction between what art is socially and economically — often, essentially, high-valued luxury goods and investment vehicles — and what artists, critics, curators, and historians say that art does and means. A national conversation about art, labor, and economics. Art Work is a newspaper and accompanying website that consists of writings and images from artists, activists, writers, critics, and others on the topic of working within depressed economies and how that impacts artistic process, compensation, and artistic property. How might it benefit SFMOMA if one large gallery is utilized expressly for 3 person shows by San Francisco artists who are not affiliated with a commercial gallery? The new wing, when it is completed, would be an excellent venue! SFMOMA could then shut down the exhibition space at Fort Mason, and exhibit the work of artists who depend on that space and hope that anybody will view their work. If the curatorial staff believes that nobody who is affiliated with the rental gallery matters, then let them state their views publicly so that for once they have an opportunity to the tell the truth. I’m also willing to draw a chart with shaded portions of a circle so that it matches the work above! However, you would have to reimburse me because I don’t work for free! I would likely have to send my clothes out to be laundered if they dirty drawing with charcoal. Please Jesus, let them hear my prayer. Thank you for all the nifty lists…I’ll pass them on!! !